The 78 mile section of the Grand Union Canal commonly referred to as the 'Leicester Line' leaves the mainline at Norton Junction. It then wends its way northwards through rural countryside to Leicester. Passing through 3 lengthy tunnels, 2 sets of staircase locks, the village of Crick, home to the annual Crick Boat Show and the Welford and Market Harborough Arms. At Foxton are the remains of the Inclined Plane one of the wonders of the canal world, subject of a restoration project and a museum detailing the lift, Foxton Locks, the waterways and the people who lived on them. After passing through Leicester along the 'Mile Straight' the canal continues its meandering path northwards to the River Trent along the River Soar skirting the university town of Loughborough. The 12 mile Erewash Canal continues northwards from the River Trent at Long Eaton to Langley Mill. This short and under utilised canal passes several towns including Ilkeston, Sandiacre and Eastwood on the way but maintains the feel of a quiet and rural one. This tourist map of the Grand Union Canal from Stroke Bruerne to Leicester at 1:50,000, with the River Soar and Erewash canal incorporating detailed town plans of Braunston, Weedon Bec, Stoke Bruerne, Market Harborough, Foxton, Leicester, Loughborough, Langley Mill and Eastwood at 1:12,500. 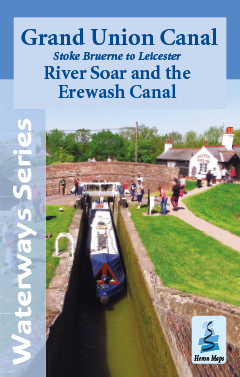 The Grand Union Canal, Stoke Bruerne to Leicester, River Soar and Erewash Canal map is available to buy online or by telephone from our business partner, Guidepost. Click on the logo below to visit their store.